Road Tripping America | Your guide to road tripping throughout America. Travelling west on Route 66 through Texas we come to the small town of Adrian. Our goal is to find the Mid Point Café. Driving through town we see a few buildings, most of which look like they haven’t been occupied in years. I start to wonder if we are going to find it or if there is anything left to find. 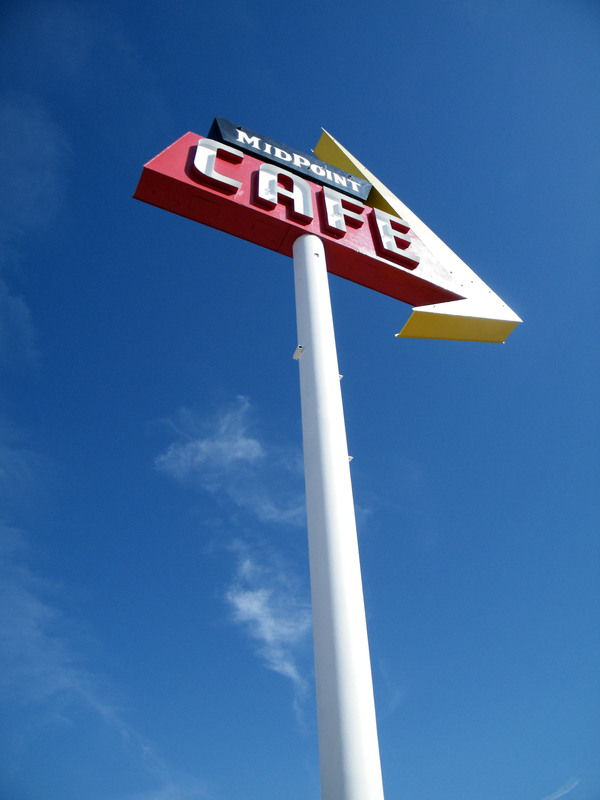 Beyond the old buildings we see a sign, about eighty feet in the air, “Mid Point Cafe”. Sign in front of the Mid Point Cafe. Adrian, Texas. Once again we have arrived at our destination with ease. We pull in to check the place out and take some pictures. The whole strip is quintessential Route 66. The café itself sits between an old service station and the Fabulous 40’s Motel. Across the road from the Mid Point Cafe are signs marking the actual mid-point of Route 66 itself, 1139 miles to Chicago, and the same to Los Angeles. After checking out the strip and taking some pictures we turn our focus to the café. We walk towards the building, and see another sign, “Closed”. Disappointment sets in. As we turn to head back to the car, we hear a voice. A woman appeared from the doorway, “Hi there. We’re closed, but if you would like you are more than welcome to come in and look around.” Of course we jump at the chance and follow her in. Once inside the woman introduces herself as Fran. We chat back and forth about Route 66, and the history of the café. She tells us that she will be opening back up for business the following week and they are getting things ready for the opening. After talking for a few minutes Fran takes us in a tour of the place. She walks us through the dining room and into the kitchen where we meet Joann, the resident baker. Fran and Joann are wonderful and show us everything, from the freshly baked pies, to the 1930’s stove and butcher block that they still use today. The whole place is a throwback to the old days of the Mother Road. After the tour and grabbing some pictures, we head into the small gift shop, buy some souvenirs and say our goodbyes. Fran and Joann made our day and showed us the true essence of the old road. The people here are friendly, caring and enjoy what they do. They are here to provide a roof over our head, warm food on the table, and some good conversation. Slowly these places are disappearing, becoming a thing of the past, but here in Adrian, Texas the Mid Point Cafe is alive and well, providing adventurous travelers and locals alike with good food and a friendly smile. One of the most common excuses for not taking a vacation or road trip, for many people, is money. Once you add up the cost of gas, lodging, food, rental cars, it can be a bit overwhelming, especially for a traveler on a budget. Over the years we have taken many trips on extremely tight budgets, and we wanted to share some simple tips to help you cut cost and save for your dream vacation. Start saving for your trip as early as possible, a relatively small amount from each paycheck can add-up quicker than you may expect. Also start paying for your trip as early as possible. Once you are certain of your travel dates, start booking and paying for lodging and in some cases rental cars. Not only does this spread the cost out over a longer period, some places offer discounts for paying in advance. Be sure to ask about any cancellation policies before making reservations. Start checking rates as early as possible. When you see the cheapest rate, book it, in most cases you can cancel the reservation and re-book if the price goes down. Use the Internet to get the best deals. Not only do many hotels, and car rental companies offer their best rate online, you can check the rates more often and book when the rates are lowest. Also be sure to exhaust all your resources before booking. Many travel sites claim that booking your rental car and hotel together can save you money, but this is not always the case. Start a new savings account specifically for your trip. This will put more red-tape between you and your savings making it that much more difficult to get and spend. Don’t spend change. Every time you break a dollar, add the change to a collection. The amount of money you can save this way may surprise you. Be flexible, especially when it comes to lodging. Many of the large travel sites only give you the name brand and larger hotels. Use Google Earth or Maps to find hotels on your route, then go to a site such as Tripadvisor.com to find reviews and ratings from other travelers. Some of the smaller mom and pop places offer great room at great prices and you can save you big bucks over the larger chains. Camping is one of the best way to save money on lodging. There are many wonderful campgrounds in every region of the country that not only offer a cheap place to stay, they provide an excellent opportunity to spend time exploring your surroundings. Another great way to save money on lodging is by planning a trip around friends or family members. If they don’t mind you staying with them for a day or two, you could save big bucks that you would have otherwise spent at a hotel or campsite. Limit the money you spend on gas station snacks and at restaurants by buying food at grocery stores and keeping a cooler on you. The small purchases can add-up quick, and you can find yourself twenty dollars short on gas money on that last leg of your trip. Be aware of any discounts you can take advantage of before and during your trip. AAA discounts you are probably aware of, but others you may not. Many employers offer discounts on a variety of things including hotels and car rentals. Also some major hotel chains offer discounts to friends and family members of their employees, so be sure to ask if you know anyone who works at a hotel. One of the biggest costs for most road trips is gas. The best way to save on gas is by knowing where to get it cheap. You can check gas prices at gasbuddy.com, a site dedicated to saving gas. They have gas prices by state, city, and map views, as well as the best fuel cost calculator out there. When it comes to rental cars make sure you know what coverage to pay for at the rental counter. When renting a car, many people do not realize the extra costs associated with the rental such as insurance, damage waiver, extra driver fees, etc. Make sure you’re covered, but also know what you actually need. In most cases, your car insurance will, at the very least, provide liability coverage, and in some cases full coverage. Check with your agent so you don’t get caught paying for extra coverage. If your policy does not cover rental cars, there are other ways to save as well. Most major credit card companies offer insurance and damage waiver at no cost, providing you use their card to pay for the car. If neither apply and you don’t want to pay the upwards of twenty dollars a day for damage waiver, there are third-party companies out there, such as Travel Guard, that offer rental car coverage. While we have not yet used Travel Guard, and cannot attest to how good the service is, their services start at $9 a day for coverage, and most major rental car companies accept their coverage. Be sure to check out our new planning and travel tools page to help plan and execute your next road trip. Just Added: Rental Car Tips & Information, all the information you will need to select the rental car company that is right for you.